Wastepaper Prose : Collected Works of Maggie Stiefvater Winners! Is it a book cover? Is it a cake? No! It's both. But this post has nothing to do with cake. That, there to your right, is just a taste of the fun photos I'll be posting soon when I dish about the Linger launch party. It's just so much cooler than posting the book cover, which I've posted a million times over. Sandra M, winner of the signed Books of Faerie prize pack. Laura B, winner of the signed Wolves of Mercy Falls prize pack. Katelyn (The Bookshelf Sophisticate), winner of a signed, doodled copy of Shiver. I've emailed all of you and will get your books in the mail as soon as possible. And to everyone else who entered, don't be sad because, well, I kind of lied earlier in the post. I do have more books to give away! 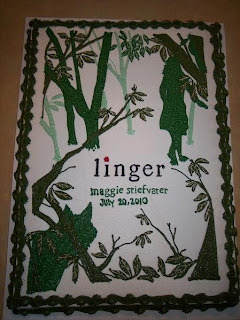 Stay tuned for a post about Maggie's launch party and another giveaway featuring a signed, doodled copy of Linger and a super special prize. Congrats to the winners!! Can't wait to see the future giveaway! That cake is amazing! Can't wait for more Linger-related giveaways! That is an awesome cake. I haven't read Shiver yet, am I crazy? What a fabulous cake! Almost too good to eat...almost. A great contest as well. Can't wait! Thanks again for the contest!